If you’re trying to eat Paleo, gluten-free or grain-free, there’s one thing that you’ll miss right away. The fact is that most recipes for grain-free or gluten-free pizza produce hard, crumbly (or off-tasting) crusts that behave nothing like the real deal. And that’s why I’m so excited to share THIS recipe. Because it’s nothing like those others! You want flexible crusts that you can pick up with your hands? You got it. How about a crust that is chewy yet crunchy-–one that actually reminds you that yes, you’re eating pizza? It’s all right here! This crust is super versatile too. We’ve even used it to make calzones! Why does this crust turn out differently? There’s some top secret techniques to making it, plus a few unexpected ingredients. True, it’s far from the traditional Italian way, but it’s the key behind the real-crust-texture of this pizza crust. 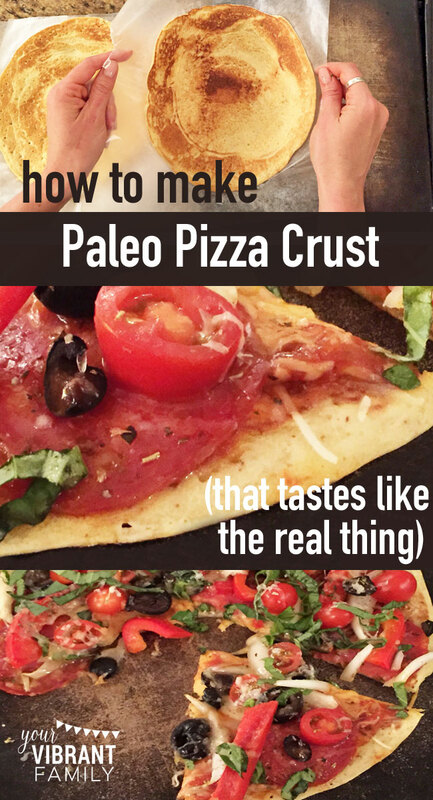 Ready to discover these secrets and have REAL pizza crust again? Let’s go!